The winners of the Waterford Film Festival were announced on Sunday night (November 9) with the 1st prize going to They Call Me The Kid, director Mark Tehnusko, written by Alan Power (from Tramore!) and produced by Sej Dave. The runner up was The Bullet Catch, director Xathe Z. Young, written by Dan Williams and produced by Catherine Attwood. 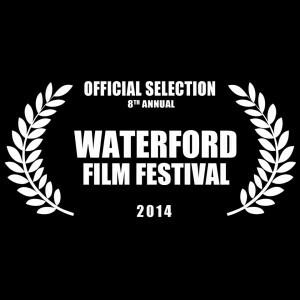 A special adjudicator’s mention was for Waterways director & writer Carrie Crowley, produced by Catherine Keating. The winner of the Screenplay competition was Jonathan Hughes for The Wake. Runner up was Howard Jones for Cynic. In all the festival screened 36 films including two with Question & Answer sessions (out of competition) Rainbow Chaser by Conor Heffernan and Skunky Dog by Patrick Slattery and James Fitzgerald. The Waterford Film Festival is delighted that Garter Lane Arts Centre is hosting this year’s event including the screening of 36 films! Garter Lane Arts Centre allows a full cinematic experience, with Blu – ray or DVD screened through a full HD Multi Media Projector incorporating two 330 watt projection lamps for great colour and clarity. The full-sized cinema screen allows films to be screened in widescreen 16:9 format, and with Dolby surround sound, the optimum cinematic experience will be guaranteed. Films this year are from all around Europe including a strong showing from the UK and as far as USA and Canada. There are also a number of Waterford films in the festival including pieces from renowned filmmaker Paul Bolger and a film from Carrie Crowley. Amongst the highlights are the screenings of two short films out of competition back to back with a Q & A session from the filmmakers. A short documentary called Rainbow Chaser by Connor Heffernan and an award winning short film called Skunky Dog by a local and first time director James Fitzgerald. Unfortunetly the work shop with David Burke Head of Universal Pictures Ireland has had to be cancelled due to a familly bereavement, however it will go ahead later in the year – details to follow. Ticket purchases will be fully refunded. The screenplay competition is now in its 7th year. The winner will be announced at 8pm on Sunday the 9th of November. The award will come with a cash prize of €500 and will also include 5 days’ worth of filming equipment and 5 days access to editing facilities from FilmLAB Waterford. This entry was posted on November 7, 2014 by waterfordarts in Arts Office Projects, Film and tagged 8th Waterford Film Festival, Arts and Entertainment, Arts Office, Carrie Crowley, Film, Film Festival, Fim Festival Shorts, Garter Lane Arts Centre, International Film Festival, Paul Bolger, Pillerstone Films, Short Films, Shorts, Waterford Film Festival, waterfordarts.com.